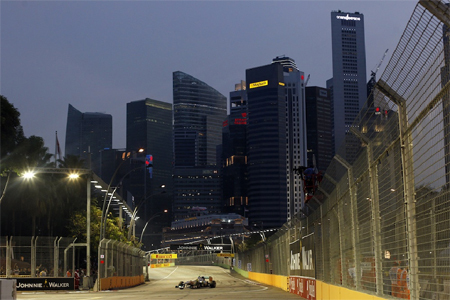 26 April 2012, Singapore – Singapore GP will be releasing single-day 2012 FORMULA 1 SINGTEL SINGAPORE GRAND PRIX Zone 4 Walkabout tickets on 1 May 2012, 0900 hrs (Singapore time). The race is on for fans to purchase the first 3,000 single-day walkabout tickets per day at special promotional prices. At the same time, with the end of the early-bird phase, all three-day tickets and the Sunday single-day Pit Grandstand Special will be sold at the regular price (see Annex 1). From 1 May 2012, fans can enjoy a preferential rate of S$38 (Friday), S$108 (Saturday), and S$148 (Sunday) for the first 3,000 single-day walkabout tickets sold for each day, limited to six tickets per transaction. After the first 3,000 promotional tickets have been sold, the single-day Zone 4 Walkabout tickets will be made available at the regular price of S$58 (Friday), S$128 (Saturday), and S$168 (Sunday). With a Zone 4 ticket, fans can enjoy hours of thrilling Formula One and support race action, as well as world-class entertainment such as Jay Chou (Friday), Maroon 5 (Saturday) or Katy Perry (Sunday), as part of the overall ticket offerings. By taking advantage of the Group Booking Special available for Pit, Padang, Bay and Esplanade Waterfront Grandstands, patrons can enjoy up to 17% savings for four or more tickets in a single transaction. To enjoy greater savings, fans can pool together a group of eight or more and enjoy up to 25% off. Fans who would like to experience a varied race experience from a different location each day can choose from the value-for-money Turn 1, Padang, Bay and Zone 4 Combination Packages, priced from S$498 (regular phase). For example, those who would like to experience the best of the racing action as well as entertainment at the main Padang stage can opt for the Zone 4 Walkabout Combination that combines the Pit Grandstand (Friday & Saturday) and Zone 4 Walkabout (Sunday) tickets at S$748, during the regular phase. The Combination Packages, which were launched for the first time last December, have been extremely well-received, with very limited tickets remaining for the Turn 1 and Padang Combinations. The Sunday-only Pit Grandstand special, priced at S$988 (regular phase), is tailored for fans who would like to enjoy the thrilling race action at the Pit Straight but are unable to attend the race on Friday and Saturday. With this Zone 1 ticket, they can also access the entertainment offerings throughout the circuit park on Sunday, including Katy Perry, The Proclaimers, Pretenders and Bananarama. 2012 FORMULA 1 SINGTEL SINGAPORE GRAND PRIX tickets are available for sale online at www.singaporegp.sg, via the ticketing hotline +65 6738 6738 as well as at all SISTIC outlets.